You are at:Home»Weekly Forex Forecasts»USD JPY Forecast»JPY is still the No. 1 safe-haven, beating the USD but will this continue? JPY is still the No. 1 safe-haven, beating the USD but will this continue? The USD/JPY was on the back foot but relatively stable as stock markets dropped sharply. The turn of the month features the Non-Farm Payrolls and other events. Stock markets continued suffering, with Wall Street leading the charge. The drops triggered further criticism by US President Donald Trump against the Federal Reserve. Trump said that his choice of Jerome Powell as Fed Chair may have been wrong and said that falling stocks are not related to his trade policy. The greenback gained ground across the board but not against the safe-haven yen. Japan’s currency attracts safe-haven flows, and this was the case throughout the week. The pair remained balanced. US data was mixed. Durable Goods Orders beat on the headline but missed on the core figures. New Home Sales missed expectations, but this may be attributed to the Florence hurricane. The sending of bombs by mail to former Presidents Obama and Clinton as well as prominent Trump critics is currently in the headlines. It is unclear how it will affect the elections. The week begins with the Fed’s favorite inflation measure: the Core PCE Price Index. As the Core CPI remained unchanged in September, also this gauge is projected to stay put. Personal Income and Personal Spending are expected to continue rising. The S&P House Price Index is Tuesday’s highlight amid growing signs of a slowdown in the US housing sector. Things warm up on Wednesday with the ADP Non-Farm Payrolls. This first hint towards the official figure on Friday does not always provide a perfect prediction but moves markets nonetheless. After a remarkable increase of 230K in September, a more moderate advance is likely for October. Another hint towards Friday NFP is due on Wednesday. The ISM Manufacturing PMI stood at a robust score of 59.8 points last month, reflecting healthy growth. The Prices Paid component is also of interest as it represents inflation expectations. The big event comes on Friday with the Non-Farm Payrolls. The monthly US jobs report disappointed on the headline in September with only 134K jobs gained. Wages came out at 2.8% as expected while the Unemployment Rate fell to 3.7%, the lowest levels since 1969. With stable wages and volatile job gains, salaries do not command the reaction as they used to only several months ago. Both numbers will compete for attention. Apart from the data, politics are warming up ahead of the all-important US Mid-Term Elections, due on November 6th. Current polls suggest that Democrats will take the House while Republicans will retain the Senate. The stable election polls come despite a slight improvement in Trump’s dismal approval ratings. A divided government will derail further tax cuts and de-regulation that markets like. It could also stop the US Dollar’s rally. 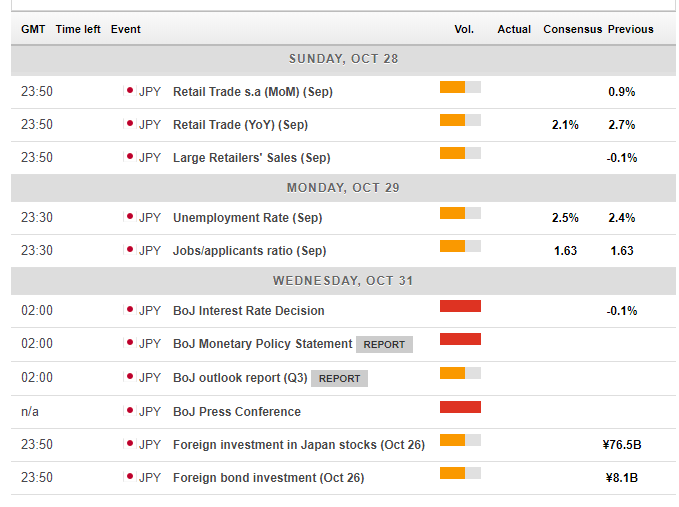 The economic calendar for Japan is relatively busy. 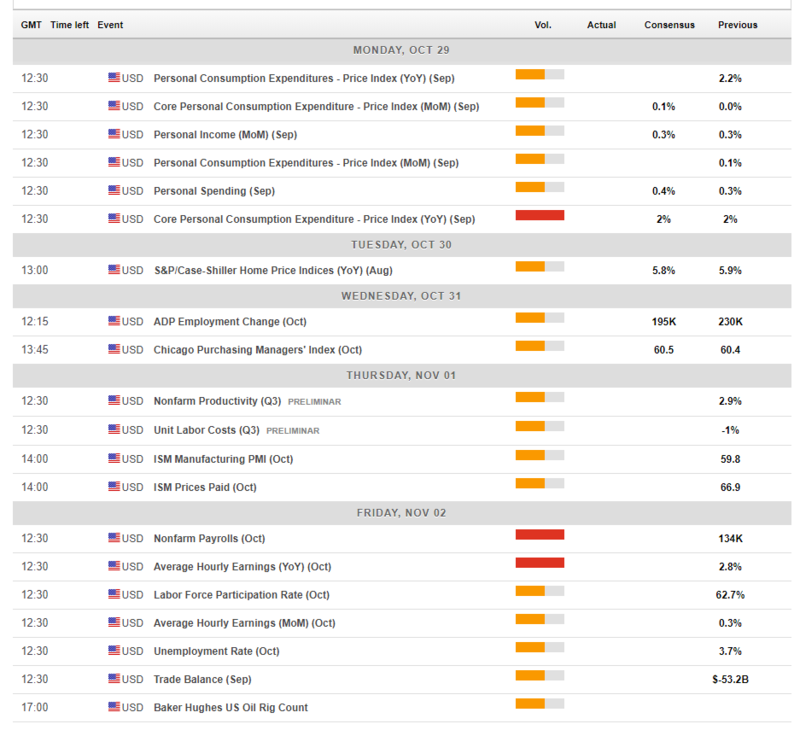 It includes the retail trade numbers in the wake of the new week, and the jobs report on the following day. More importantly, the Bank of Japan convenes early on Wednesday. Governor Haruhiko Kuroda and his colleagues are likely to leave the interest rate unchanged at -0.1% and also continue to keep 10-year yields at low levels. A “stealth tightening” is unlikely despite PM Abe’s call for a change of direction. With Japanese figures hardly moving the currency, stocks remain at the center of attention. The Yen will likely continue to attract safe-haven flows in the case continue to tumble across the board. Relief rallies will probably weaken the currency, thus boosting the USD/JPY. Developments around North Korea can also impact the yen, but talks have been on the backburner so far. The USD/JPY stabilized after falling off the steep uptrend channel that it followed in September. However, other signs point to the downside. The pair is struggling to keep up with the 50-day Simple Moving Average. Moreover, Momentum has significantly shifted to the downside. The Relative Strength Index is leaning lower but far from oversold territory. 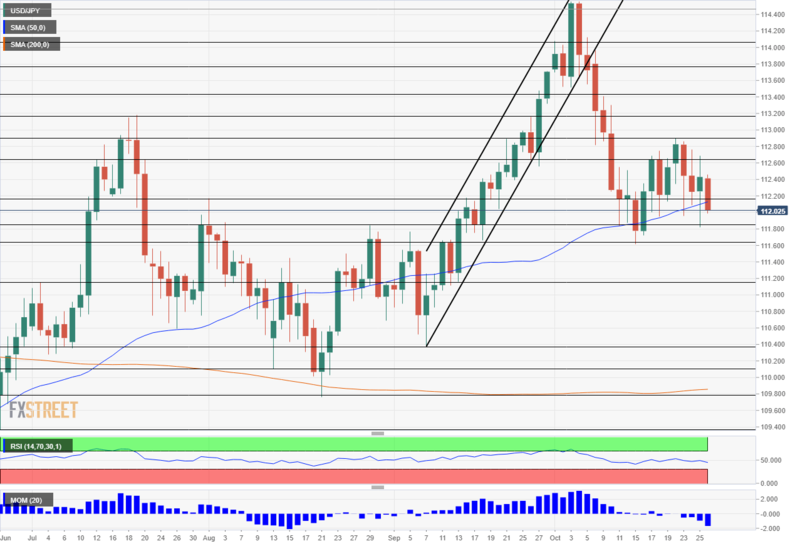 111.80 provided support during this week and capped the USD/JPY back in August. 111.60, quite close by, was the low point in October so far. Further down, 111.15 was a stepping stone on the way up back in September. Much lower, 110.40 was the basis for the steep uptrend support line. 110.10 defends the round level of 110.00 and 109.80 is the next line to watch. 112.20 was a swing high back in July and is a pivotal line in the range. 112.65 worked in both directions in September and October. 112.80 was a high point in mid-October while 113.15 held the pair down in July and remains relevant. The risk-off sentiment will likely continue for another week, as uncertainty grows ahead of the Mid-Term elections. In addition, Trump is not letting down on the trade wars and the Fed is not budging either. Therefore, the safe-haven Yen will likely keep up with the greenback or even beat it. The FXStreet forex poll of experts provides intriguing insights.